Some beekeeping practices can be harmful for bees. When we look for the why in harmful bee management, we find our answers in misinformation, lack of awareness or, unfortunately, greed. As a results, our bees are weakened, unable to defend themselves against diseases and parasites (cause #2). These practices include migratory beekeeping, unnatural feeding, chemical treatments and international trade of bees1https://entomologytoday.org/2017/04/10/why-human-behavior-is-hurting-honey-bees/. What is migratory commercial beekeeping? Most of the large-scale beekeepers do not make their money from honey production. Their profit lies in pollination services, lending their colonies to farmers. Large monoculture crops require pollination for a few weeks in the growing season, yet the scorched earth method of agricultural businesses leaves no other plants for honeybees to live on during the rest of the year. That’s where migratory beekeeping comes in. 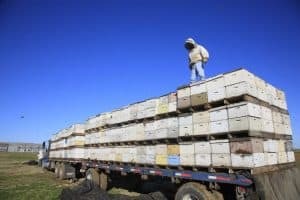 Truckloads stacked with beehives crisscross the country for months. Nearly two-thirds (!) of the estimated 2.4 million colonies in the U.S. are transported for pollination purposes2http://www.abfnet.org/. Long-distance transport exposes bees to temperature fluctuations and diminished natural foraging opportunities. This leads to immune-suppressing stress. Besides, high-fructose corn syrup, that often supplements the diet of these highly mobile bee populations can be an additional harmful factor. A recent research compared the prevalence of viruses in migratory bees to locally maintained bees. The migratory bees were more consistently infected and showed even triple infections. The massive honey bee disappearance is more prevalent in transported, not locally maintained, honey bees. Some migratory beekeepers have lost up to 90 percent of their colonies3Beekeeping Practices are Killing Honeybees, Part I January 30, 2010 by: Laura Weldon https://www.naturalnews.com/028055_honeybees_colony_collapse_disorder.html. Additionally, moving the hives around can exacerbate the spreading of diseases. 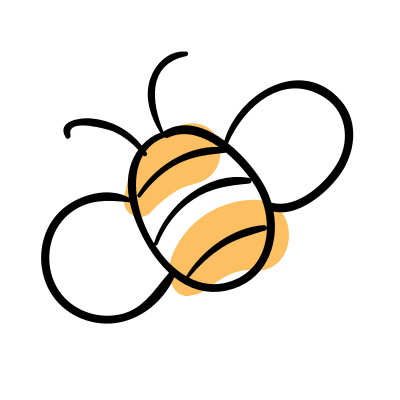 An infected hive can spread disease when it intermingles in the fields with the local honey bees. However, it is important to make a difference here. There are also beekeepers who practice “non-commercial” migrating. These beekeepers might not live in an area where there are always enough blossoms, so they travel with the hives to places where better pasture (nectars and pollens) is provided to keep their bees in good health. This is another kind of migrating and is seen as positive and, in some areas, necessary. This being said, the best practice for the bees would be to not move around. What does “unnatural feed” mean? The only natural food for honey bees come from the nectars and pollens they collect. These food contain vital nutrients that optimize their health. A lot of beekeepers nowadays commonly feed their honeybees artificial syrups made of high fructose corn syrup (HFC) or water/sugar mixture. Unlike the rich mix of fat, protein, vitamins and minerals found in pollen and nectar, this artificial food is devoid of any real nutrition. This kind of feeding bears the natural consequence of a weakened bee colony. The lack of genetic diversity might be weakening bee, some researchers believe. Bees are a business. Many beekeepers start hives by buying a queen bee. Nearly all the bees in the United States are descended from a limited number of queen bee lines. It is suggested that the limited gene pool may be the reason for degradation of the bees’ immune system and ability to survive4https://dengarden.com/gardening/What-is-Killing-the-Honey-Bees-Colony-Collapse-Disorder. This is quite similar to the inbreeding process in a lot of animals, including human. Just as other livestock cannot thrive if they are overstocked onto insufficient pasture, too many hives in one area compete for limited resources. If a beekeeper places a hundred hives into an apiary that has adequate forage for only two dozen, he can expect those colonies to have problems5http://scientificbeekeeping.com/sick-bees-part-18c-colony-collapse-revisited/. Honey bees increasingly suffer from diseases and parasites, forcing their keepers to fight back with powerful chemicals. Therefore, a lot of today’s beekeepers use herbicides, fungicides and insecticides in and around beehives. Additionally, the careless application of pest management principles have lead to overuse of pesticides and antibiotics. This results in increased resistance to the same antibiotics among honey bee parasites and pathogens such as the Varroa destructor mite and the American foulbrood bacterium (Paenibacillus larvae). The international trade in honey bees among beekeepers and honey bee products has further enabled the global spread of pathogens such as varroa destructor, tracheal mite (Acarapis woodi), Nosema, Small Hive Beetle (Aethina tumida), and the fungal disease chalkbrood (Ascosphaera apis)6Beekeeping Practices are Killing Honeybees, Part I January 30, 2010 by: Laura Weldon https://www.naturalnews.com/028055_honeybees_colony_collapse_disorder.html.